Gorgeous shades of pinks and oranges set the tone for the breathtaking Chiara Boni La Petite Robe Spring 2016 Collection inspired by a blossoming rose garden. The elegant clothing, including swimwear and party dresses, were all accented with delicate bursting rosettes that emphasized the collection’s ladylike hues. 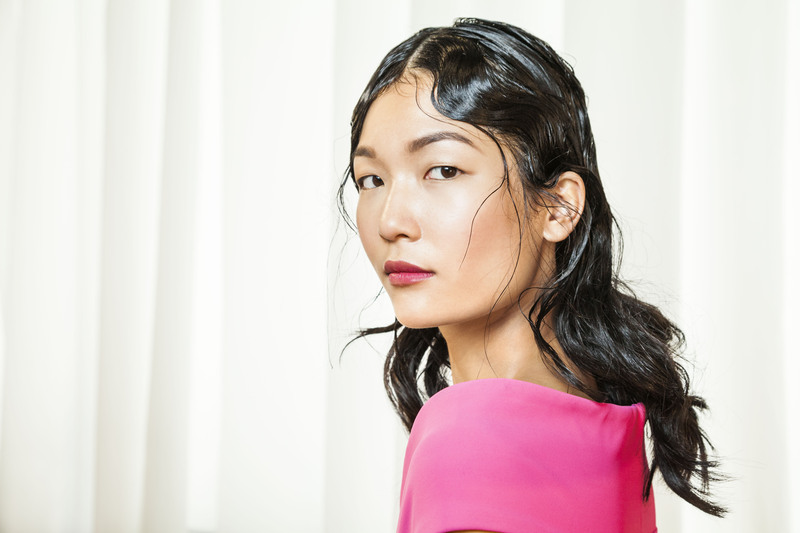 Speaking to the story of flowering blooms, Janell Geason, Aveda Global Artistic Director for Makeup, emphasized the look of a fresh budding rose through glistening skin and perfectly pretty pink lips. 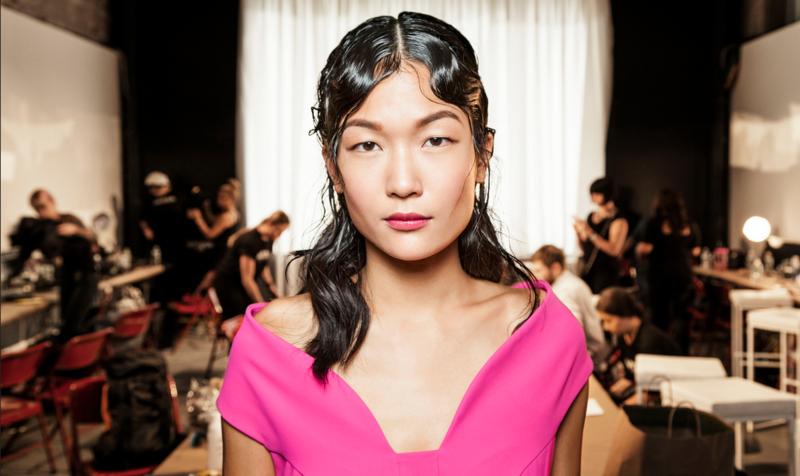 “The key to the look is bright pop of color on the lips accented with shine to highlight the fresh and vibrant feel of the clothes,” Geason said. Step 1: Create a luminous, fresh complexion with Inner Light Mineral Tinted Moisture and Inner Light Concealer where needed. Set lightly with Inner Light Mineral Loose Powder. Step 2: Lightly apply Petal Essence Single Eye Color in Opal on top lash line. Step 3: Curl lashes and apply Mosscara Black Forest. Step 4: Fill in brows, if needed, with Petal Essence Eye Color Trio in Gobi Sands with brow brush. Step 5: With a blush brush apply Petal Essence Face Accents in Apricot Whisper along the cheekbones. Step 6: Add a touch of Petal Essence Face Accents Rose Blossom to the apples of the cheeks. Step 7: Line the lips with Nourish-mint Lip Liner in Purple Sage and blend edges inwards. Step 8: Fill in lips with Nourish-mint Smoothing Lip Color in Wild Fuchsia with brush. Step 9: Add a touch of Nourish-mint Rehydrating Lip Glaze in Sun Kissed Melon to the center of the lips. Gorgeous pinks and oranges set the tone for the breathtaking Chiara Boni La Petite Robe Spring 2016 Collection inspired by blooming flowers in a secret garden. The elegant clothing included swimwear and party dresses that were accented with delicate bursting rosettes that emphasized the collection’s ladylike hues. To intertwine with the collection, Aveda Guest Artist Jon Reyman created pretty layers of textured hair, accented with sleek modern finger waves framing the beautiful faces. “The slick waves emulated the look of rose petals, and organically transitioned into free- flowing hair that was little wild and natural, like a blooming flower.” Reyman said. 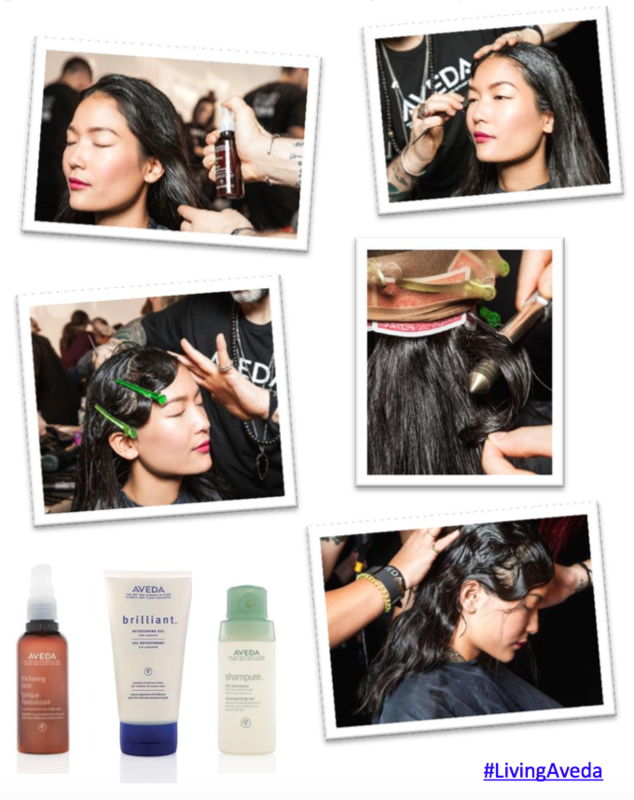 Step 1: Prep hair with a liberal misting of Aveda Thickening Tonic and blow dry hair for texture. Step 2: With hair parted down the center, apply a generous amount of Aveda Brilliant Retexturizing Gel to the top half of head to create the wet appearance. Step 3: On the right side, begin forming a traditional finger wave from the top of the part going down to the back of the ear. Set each waved section with a clip. Repeat on the left side. PRO TIP: Place a playing card under each clip to avoid ridging on the hair. Step 4: Once done, place a stocking cap on clipped waves to further set style. Step 5: With the top drying, begin wrap hair that is hanging loose around a 3⁄4” barrel curling rod. Step 6: Use a wide-tooth comb to pull out the freshly set curls for a flowing loose wave. Step 7: Apply new Aveda ShampureTM Dry Shampoo (Available November 1, 2015) on the back for added texture and remove the cap and clips. Let the finger waves hang naturally. Show us your Spring 2016 New York Fashion week inspired look by including #AISouth in your pictures!